Very beautiful ford eco sport. This Ford Eco Sport 1.0 EcoBoost Titanium in Black comes with alloy wheels, daytime running lights, rear parking sensors, half leather interior, electric windows, air conditioning, heated windscreen and bluetooth connectivity. Perrys Blackburn - Peugeot - Call us on 441254916486 or click here to find out more. Saxon Bridge - Call us on 441908049652 or click here to find out more. Fred Henderson Ltd - Please don't just compare a car by its picture, come and visit us. You will not be disappointed. - Call us on 441917317904 or click here to find out more. Park Lane Cars - Call us on 441782969901 or click here to find out more. 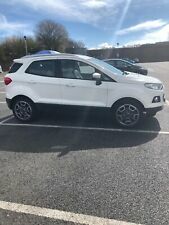 FORD ECOSPORT ST LINE ECOBOOST, 2018. Automatic headlights,Black roof rails. B&O music upgrade. Ambient light,Auto dimming rear view mirror. New listing2016(65) Ford EcoSport 1.5TDCi ( 95ps ) Titanium, £30 road tax!